There's more to Awesome Games Done Quick than what's on the Twitch stream. People are hanging out, playing games, and casually trying to break world records. You know, normal stuff! 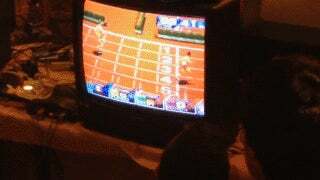 One record involved Track & Field 2000 for the Nintendo 64, hitting A and B over and over again, and hoping for the best. The 100-meter dash was waiting to be broken. The record? 9.43 seconds, set by a player in Poland. Several well-known speedrunners, including The Legend of Zelda: Ocarina of Time player Cosmo Wright, tried to break the record. Cosmo fell just short, hitting 9.51 seconds. Arie2929, who primarily speedruns Mirror's Edge, came really damn close: 9.45 seconds. Over the course of 24 hours, many tried and failed. Finally, former Kirby, Diddy Kong Racing, and Super Mario RPG speedrunner 0xwas stepped up to the plate, and he nailed it: 9.41. Cue screaming, chanting, and, of course, making it rain.